Well, I know what I am doing for Valentine's Day. Yippee-ki-yay, Stars are on tour all throughout February, crisscrossing these great lands of ours, which is an excellent thing in my book. 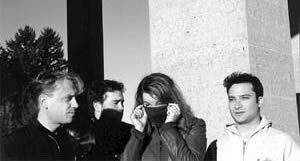 Stars was a top recommendation to me of 2005, "finely-crafted melodic indie pop" out of Canada (on the Arts & Crafts label), with intelligent, witty, and oft-scathing lyrics, great harmonies, and really rich instrumentation with a lot of strings. Off for a beautiful day of skiing with the girls. why are great bands scared of kansas city!? AARGH! Once again, you've introduced me to a great new artist. First it was the Notwist, now the Stars. I think I may know what I'm spending Brian's iTunes gift card on! ahh the Stars...one of our(Canada)best kept secrets! Ageless Beauty is a masterpiece of a song!